*Received hardcover copy from publisher in exchange of an honest review. Fifteen year old Izzy Brannick was trained to fight monsters. For centuries, her family has hunted magical creatures. But when Izzy's older sister vanishes without a trace while on a job, Izzy's mom decides they need to take a break. Izzy and her mom moves to a new town, but they soon discover it's not as normal as it appears. A series of hauntings has been plaguing the local high school, and Izzy is determined to prove her worth and investigate. But assuming the guise of an average teenage is easier said than done. For a tough girl who's always been on her own, it's strange to suddenly make friends and maybe even have a crush. School Spirits was very fast paced, light, and interesting as it went. I liked the story. I found it rather mysterious, creepy, and often times amusing reading about this super bad young girl getting flustered trying to fit in among her peers. I wouldn't exactly recommend watching a cheesy teen drama to gain perspective on how to function with "normal" teens, but it was quite funny how Izzy was learning these silly things from fictional characters reading from a script. She didn't have many other options being that her mom, who seemed all about fighting and destroying evil, wasn't the mushy type. And I had no problem with that. I felt that Aislinn (love the name) expressed her feelings differently, though, I liked that towards the end she showed a softer side somewhat. But then again, Aislinn does have her older daughter to find and that alone is difficult for any parent, much less trying to keep your other child safe. Back to Izzy. I liked her character. She wasn't necessarily the average 15 year old but she certainly was an interesting one. I liked the unknowing attraction she felt for Dex and the instant friendship she developed with Romy and Anderson. But the moment Dex came in the picture I knew there was more going on with his character, and even when his family was brought up. I also enjoyed his way of speaking and his fashion sense. Though, I couldn't see what he was wearing, the descriptions set my imagination to work. Romy's the type of friend I like to have. She has a great sense of humor, straight-forward, determined, and really cares for her friends. I liked how she accepted Izzy and just brought her into their group and made her feel comfortable. And of course, I can't forget how cute she and Anderson are with the obvious fact that there's so much more to their relationship. Not to mention Anderson's little doing was silly when unraveled. Every character had a purpose and their significance was clearly identified. I liked them all. No matter if someone wasn't always present, it always made sense whenever they appeared. The overall story was nicely written; it wasn't only about Izzy taking on a ghostly case by herself, or learning to manage high school for the first time. But it was also about connecting with people outside of the paranormal world, gaining friends for the first time, understanding relationships and liking someone. Also, you can't dismiss the fact she was experiencing a period of loss and missing her sister. Not being able to share this new adventure with Finley, much less get her feedback about her developing feelings and how to cope with it all. Also, you get a feeling that she needs her mother to be a mother, not just this stern and super 'this is a job, don't get involved' kind of person. So, there was some family issues going on. Another thing I liked, besides the entertaining segments, was the mystery aspect of the story. Solving the case of the supposedly ghost, and trying to find out who caused the unleashing to begin with. Though, there could have been a bit more paranormal action throughout the book, it was an interesting story, nonetheless. And I look forward to seeing the Brannick's new adventure of taking on other cases, adjusting to their new addition, and finding leads on Finley's whereabouts. I haven't read Hawkins' Hex Hall series and have no clue whatsoever if Finley is connected to anything or anyone in those three books. 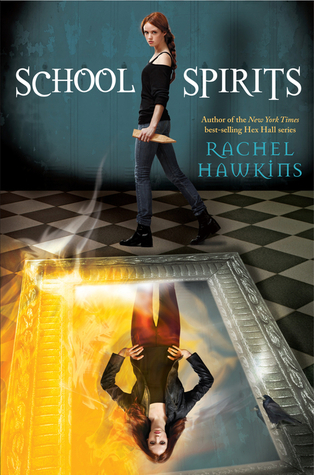 But I can honestly say that I enjoyed the first book in its spin-off and I recommend School Spirits if you're looking for a quick paced, witty, youthful and adventurous paranormal read. It's great to know that even when you haven't read the Hex Hall series, you still have a wonderful time enjoying this one! Izzy sounds like an interesting character. Loved your review, Shane! Well, I never got to finish Hex Hall (had a terrible experience with it) so I'm quite glad you don't need to read it to enjoy it. I read a lot of mixed reviews for this one, so I'm a bit on the fence... thanks for the review nonetheless! Fast paced, light and interesting sound like a plus to me.